Info material about the second volume of the IRTG Diversity's Publication Series "Diversity / Diversité / Diversität"
Spaces of Difference discusses the construction of transcultural spaces and the representation and negotiation of diversity through the analytical lenses of narratives, practices and politics of diversity. The multi-disciplinary contributions to this volume address four broader research fields: (1) the entangled and contested (hi)stories of diversity; (2) migration and the creation of transcultural spaces; (3) practices and politics of belonging; and (4) the dynamics of confrontation and cohabitation in spaces of difference. 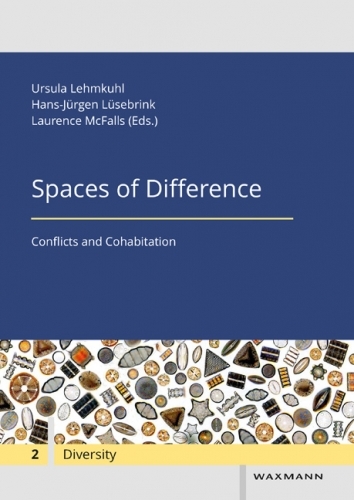 The research and the chapters added by numerous renowned contributors that Ursula Lehmkuhl, Hans-Jürgen Lüsebrink and Laurence McFalls present in this volume combine approaches from history, political science, sociology, migration studies and literature. Teresa Cappiali (Montréal); Rebecca Ferrari (Trier); Heike Härting (Montréal); Ursula Lehmkuhl (Trier); Hans-Jürgen Lüsebrink (Saarbrücken); Chowra Makaremi (Paris); Laurence McFalls (Montréal); Carolyn Podruchny (Toronto); Dave Poitras (Trier); Sophie Schram (Trier); Jesse Thistle (Waterloo/Toronto); Nikola Tietze (Hamburg/Paris); Xymena Wieczorek (Trier). In der Vergangenheit dominierten Migrationstheorien, die eine Vogelperspektive einnahmen und deren Erklärungen für komplexe Wanderungsentscheidungen begrenzt waren. Die Perspektive betroffener Menschen und ihrer Kontexte einzunehmen, bereichert die Diskussion und liefert interessante Ansätze zum Verständnis von Wanderungs-, Integrations- und Partizipationsprozessen. Es bleibt zu hoffen, dass diese Ansätze konstruktiv aufgegriffen und weiter entwickelt werden.